The diplomats have failed. The tensions have only grown worse. Each side has pushed the other too far, so there's nothing left to do but fight. At the border of Aztlan and Amazonia, war has broken out. The streets of Bogotá are being pummeled, mercenaries are being hired and killed in approximately equal numbers, and blood is being spilled in dark rooms to give strength to mages on the battlefield. Most importantly, runners are being hired by the score.War! puts Shadowrun players into the world of open combat. 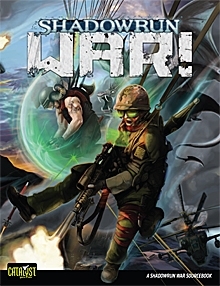 From sabotage missions behind enemy lines to intelligence operations to small-squad mercenary tactics, War! provides the background information, gear, and rules players need to plunge into the chaos of battle.